Estimation of Total Phenol, Tannin, Alkaloid and Flavonoid in Hibiscus Tiliaceus Linn. Wood Extracts. 1Department of Pharmacognosy, Pravara Rural College of Pharmacy, A/P-Loni, Tal-Rahata, Dist-Ahmednagar - 413 736, India. 2Department of Pharmacognosy, MGV’S College of Pharmacy, Panchvati, Nasik, India. The present study was performed to evaluate the total phenol, tannin, alkaloid and flavonoid contents in petroleum ether, ethyl acetate and methanol extracts of Hibiscus tiliaceus wood. Extraction of powdered wood material was carried out by continuous hot percolation method in soxhlet apparatus using petroleum ether, ethyl acetate and methanol as solvents. Gallic acid was used as standard for the determination of total phenol and tannin by Folin-ciocalteu method. Total alkaloid content was determined by chloride colorimetric method using quercetin as a standard. The results showed that ethyl acetate extract has high concentration of total phenol, tannin, alkaloid and flavonoid contents as compared by bromocresol green solution using atropine as a standard. Total flavonoid content was determined by aluminium to petroleum ether, ethyl acetate and methanol extracts. Ethyl acetate extract contained the total phenol of 30.18 and tannins of 83.03 as mg of gallic acid equivalents (GAE), alkaloids of 66.01 as mg of atropine equivalents (AE) and flavonoids of 91.01 as mg of quercetin equivalents (QE). Plants have provided mankind with herbal remedies for several diseases for many centuries. In India herbal medicines have been the bases of treatment and cure for various diseases in traditional methods such as Ayurveda, Unani and Sidha. The therapeutic potentials of plant and animal origin crude drugs are being used from the ancient times by the simple process without the isolation of the pure compounds. The pharmacological action of crude drug is determined by the nature of its constituents. Thus the plant species may be consider as a biosynthetic and for the chemical compounds example proteins, carbohydrates, and fats that are utilized as food by the animals and humans, but also for a huge number of compounds including alkaloids, terpenoids, flavonoids, glycosides etc. which exert definite physiological effects. These chemical compounds are mostly responsible for the desired beneficial properties. Natural products extracted from plants which belong to the Malvaceae family are used in the treatment of many diseases worldwide. One important genus in this family is Hibiscus spp., with more than 220 species distributed in tropical and subtropical regions. Hibiscus tiliaceus L. is a typical plant of tropical climates found in the regions of mangroves in significant quantities. An aqueous extract of wood and fresh flowers is a registered treatment for skin diseases. [4-5] Recently it was shown that methanolic flower extract exerts an antioxidant effect on the yeast Saccharomyces cerevisiae, protecting against hydrogen peroxide (H2O2) and tert-butylhydroperoxide (t-BHP) cytotoxicities. In addition, the extract was not mutagenic in Salmonella typhimurium or S. cerevisiae and showed a significant antimutagenic action against oxidative mutagens in S. cerevisiae. It is also reported traditionally, where the leaves are used to treat fevers and soothe coughs, the bark to treat dysentery, and the flowers aid in treating ear infections and abscesses. Previous pharmacological investigations of the genus Hibiscus plants indicated the presence of species with useful biological activities. The studies conducted to date have demonstrated that plants of the Hibiscus genus have the potential to provide biologically active compounds that are able to deter the proliferation of malignant cells. Thus, the Hibiscus genus deserves additional evaluation as a provider of chemopreventive agents. Indeed, there is a current need for availability of new plant-derived bioactive molecules; for the development of new drugs and may provide a cost-effective mean of treating cancers and other diseases in the developing world [7-8]. Present work was undertaken to screen to evaluate the total phenol, tannin, alkaloid and flavonoid contents in petroleum ether, ethyl acetate and methanol extracts of Hibiscus tiliaceus wood. Hibiscus tiliaceus Linn. woodwas collected from Costal side of Ratnagiri district of Maharashtra and authenticated By Dr. J. Jayanthi, Scientist "C" for Director, Botanical Survey of India, Pune, India vide letter No. BSI/WRC/TECH/2010 Voucher No. HIBCA1VIT. The herbarium is kept at BSI, Pune for further reference. Aluminium chloride, sodium carbonate, sodium nitrite, sodium hydroxide was obtained from Department of pharmaceutical chemistry, Pravara rural college of pharmacy, Pravaranagar. Folin-Ciocalteu’s phenol reagent, aluminium chloride and standard samples of gallic acid, quercetin was obtained from Department of pharmacognosy, Pravara rural college of pharmacy, Pravaranagar. For the present study, the extracts were obtained by continuous hot extraction method using soxhlet apparatus. Freshly collected wood part was cut into pieces to dry in shade and finely powdered. 250 gm of wood powder was passed through sieve no. 60 and packed in soxhlet apparatus and extracted using petroleum ether, ethyl acetate and methanol as solvents. The filtrate was concentrated in rotary evaporator and the extracts were calculated for their extractive value. Petroleum ether, ethyl acetate and methanol extracts were prepared to examine thetotal phenolic content, tannin, alkaloidand flavonoid. The results for extractive valueand for total phenol, tannin, alkaloid, flavonoid contents are tabulated in Table 1 and 2, 3, 4, 5 respectively. 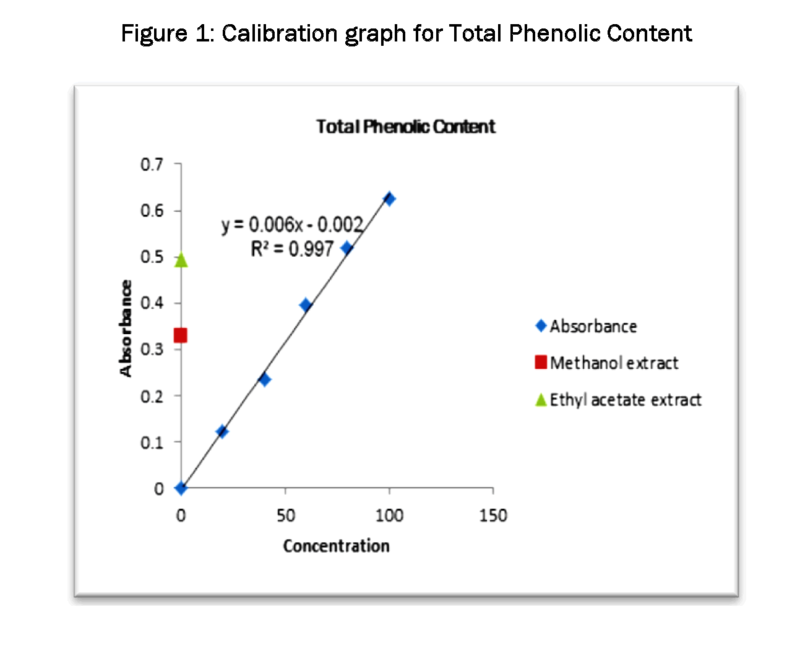 Calibrationgraphs for total phenol, tannin, alkaloidand flavonoid contents were shown in figure 1, 2, 3 and 4 respectively. The tannins contents was examined in plant extracts using the Folin-Ciocalteu’s reagent is expressed in terms of gallic acid equivalent (the standard curve equation: y = 0.057x - 0.071, R2 = 0.997). 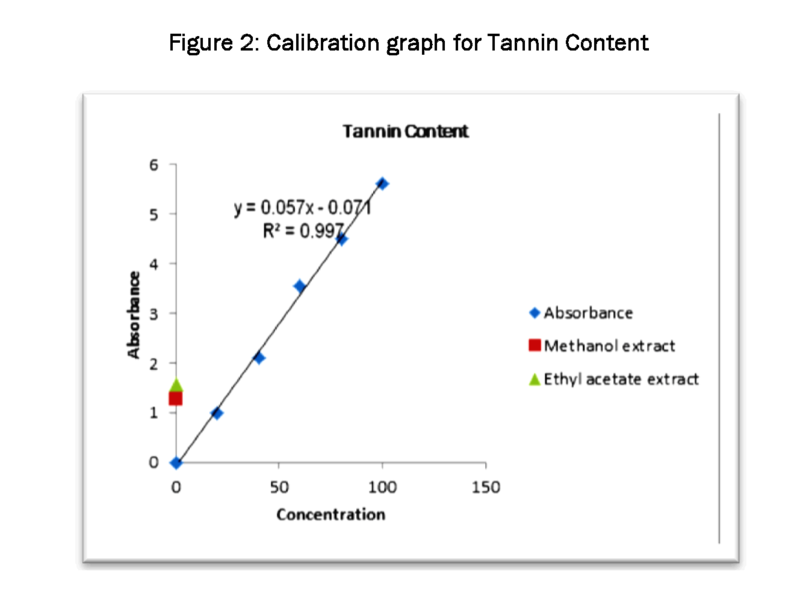 The values obtained for the concentration of tannin contents are expressed as mg of GA/g of extract.The highest concentration of tannins was measured 83.03in ethyl acetate extracts(Table 3). The alkaloid contents was examined in plant extracts and expressed in terms of atropine equivalent as mg of AE/g of extract (the standard curve equation: y = 0.006x - 0.003, R2 = 0.997). 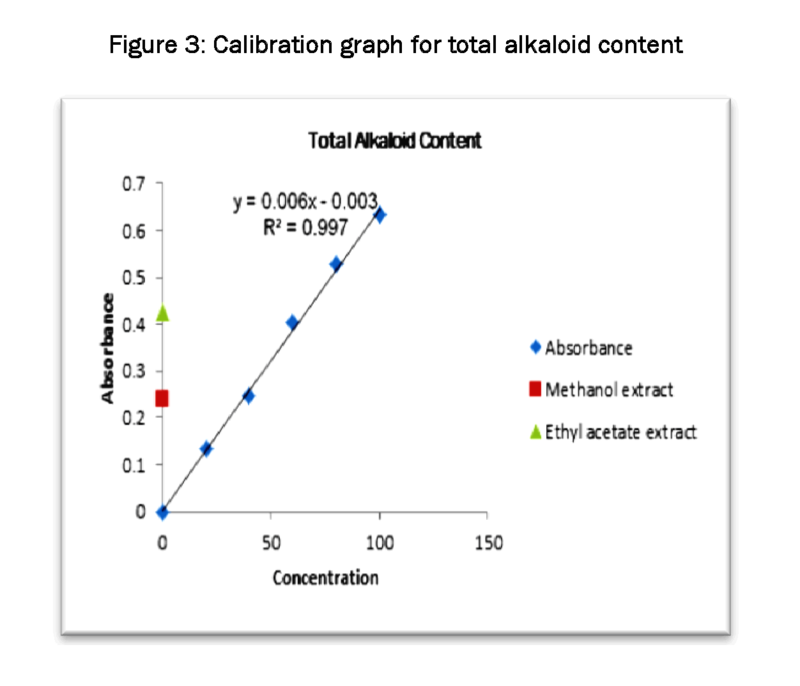 The highest concentration of alkaloid was measured 66.01in ethyl acetate extracts (Table 4). The concentration of flavonoids in various plant extracts of Hibiscus tiliaceusL. woodwas determined using spectrophotometric method with aluminum chloride. The content of flavonoidswas expressed in terms of quercetin equivalent (the standard curve equation: y = 0.009x- 0.006, R2 = 0.999), mg of QE/g of extract (Table 5). Ethyl acetate extracts of wood contains the highest flavonoid concentration as 91.01 mg QE/g. 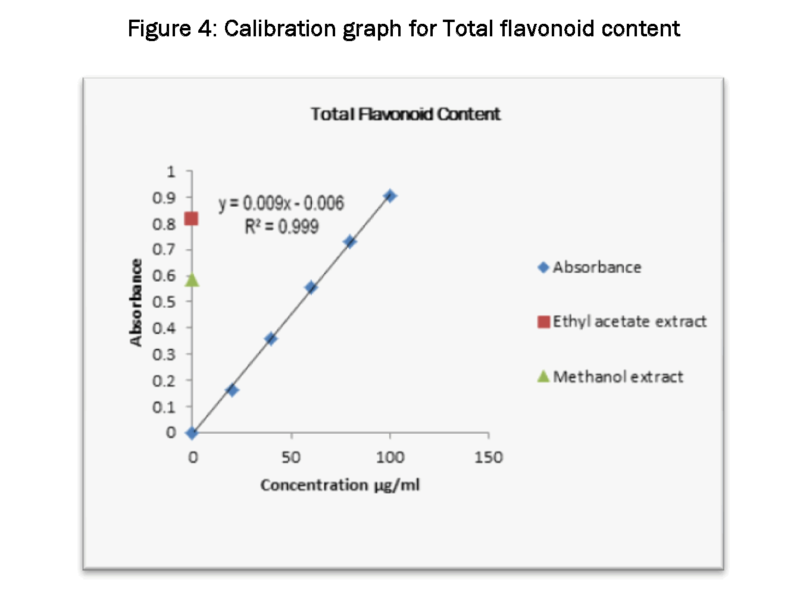 The concentration offlavonoids in methanol extract was 66.08 mg QE/g. The lowest flavonoid concentration was measured in petroleumether extract. The concentration of flavonoids in plant extracts depends on thepolarity of solvents used in the extract preparation. All the calibration graphs showed that strong positive linear correlation (r) which is close to +1. These graphs indicate that as the value of concentration increases, values for absorbance also increase. Total phenol, tannin, alkaloid and flavonoid contents in ethyl acetate extract were found to be 30.18 mg of GAE/gm, 83.03 mg of GAE /gm,66.01 mg of AE/gm,and 91.01 mg of QE/gm of extract respectively. Petroleum ether and methanolic extracts were made known less content of total phenol, tannins, alkaloid and flavonoid. In this study, total phenol, tannin, alkaloid and flavonoid contents from petroleum ether, ethyl acetate and methanol extracts of Hibiscus tiliaceus L. woodwere investigated. Ethyl acetate extract showed high contents of phenol, alkaloid, flavonoid and tannin as compared to petroleum ether and methanolic extract. The pharmacological action of ethyl acetate extract of Hibiscus tiliaceus L. woodwill be determined by the nature of these chemical compounds which are responsible for the desired therapeutic properties and definite physiological effects. The authors are thankful to Principal, Pravara Rural College of pharmacy, Pravaranagar for permitting to carry out the research in the institution. Pulok K. Mukherjee. Text book of Quality control of herbal drugs (An approach to evaluation of Botanicals) Business Horizons, Editors. New Delhi, India: p. 248; 2002. Tseng, T.H. and Y.J. Lee, Evaluation of natural and synthetic compounds from East Asiatic folk medicinal plants on the mediation of cancer. Anti-cancer Agents in Med Chem. 2006; 6: (65): 347. Petard P. QuelquesPlantes de Polynesie Francaiseet Raau Tahiti, Haere Po No Tahiti editions, Papeete. 1986. Dafallah, A.A. and Z. Al-Mustafa, Investigation of the anti-inflammatory activity of Acacia nilotica and Hibiscus sabdariffa, The American J Chinese Med. 1996; 24: 263-9. Sachdewa, A. and L.D. Khemani, Effect of Hibiscus rosa-sinensis ethanol flower extract on blood glucose and lipid profile in streptozotocin induced diabetes in rats. J Ethnopharmacol. 2003; 89: 61-6. Singleton VL, Orthofer R, Lamuela-Raventos RM. Analysis of totalphenols and other oxidation substrates and antioxidants by means of Folin-Ciocalteureagent. Methods Enzymol. 1999;299, 152-178. Ali Ghasemzadeh, Hawa, HawaZ.E.Jaafar, AsmahRahmat. Antioxidant activities, total phenolics and flavonoids content in two varieties of Malaysia Young Ginger (Zingiberofficinale Roscoe). Mol. 2010; 15: 4324-4333. Nasir Rasool, KomalRizwan, Muhammad Zubair, Kaleem Ur Rahman Naveed, Imran Imran, Viqar Uddin Ahmed. Antioxidant potential of different extracts and fractions of Catharanthusroseus shoots. Int J Phytomed. 2011; 1(3): 108-114. Milan S. Stankovic. Total phenoliccontent, flavonoid concentration and antioxidant activity of MarrubiumperegrinumL. extracts. Kragujevac J Sci. 2011;33:63-72. D Marinova, F Ribarova, M Atanassova. Total Phenolics and Total Flavonoids in Bulgarian Fruits and Vegetables. J University ChemTechnol Metallurgy. 2005; 40 (3): 255-260. Rajeev Singh, Pawan Kumar Verma, Gagandeep Singh. Total phenolic, flavonoids and tannin contents in different extracts of Artemisia absinthium. J Intercult Ethnopharmacol. 2012; 1 (2): 101-104. AfifyAel-M, El-Beltagi HS, El-Salam SM, Omran AA. Biochemical changes in phenols, flavonoids, tannins, vitamin E, β-carotene and antioxidant activity during soaking of three white sorghum varieties. Asian Pac J Trop Biomed. 2012; 2(3): 203-9. Miean K.H, Mohamed S. Flavonoid (myricetin, quercetin, kaempferol, luteolin, and apigenin) content of edible tropical plants. J Agric Food Chem. 2001; 49 (6): 3106-12. FazelShamsa, HamidrezaMonsef, RouhollahGhamooshi, MohammadrezaVerdian-rizi. Spectrophotometric determination of total alkaloids in some Iranian medicinal plants. Thai J Pharm Sci. 2008; 32: 17-20. T Mallikarjuna Rao, B Ganga Rao, Y Venkateswara Rao. Antioxidant Activity Of SpilanthesAcmellaExtracts. Int J Phytopharmacol. 2012; 3(2): 216-220. S Kaviarasan, GH Naik, R Gangabhagirathi, CV Anuradha, KI Priyadarsini. In vitro studies on antiradical and antioxidant activities of fenugreek (Trigonellafoenumgraecum) seeds. Food Chem. 2007; 103: 31-37. Hanane El Hajaji, NadyaLachkar, KatimAlaoui, YahyaCherrah, Abdellah Farah, AbdesslamEnnabili, et al. Antioxidant Properties and Total Phenolic Content of Three Varieties of Carob Tree Leaves from Morocco. Rec Nat Prod. 2010; 4(4): 193-204. Xu BJ, Chang SK. Total phenolic content and antioxidant properties of eclipse black beans (Phaseolus vulgaris L.) as affected by processing methods. J Food Sci. 2008; 73(2): H19-27. Lee Wei Har, IntanSafinar Ismail. Antioxidant activity, total phenolics and total flavonoids of Syzygiumpolyanthum (Wight) Walp leaves. Int J Med Arom Plants. 2012; 2(2): 219-228. Mohsen, M.S., Ammar, S.M.A. Total phenolic contents and antioxidant activity of corn tassel extracts. Food Chem. 2008;112: 595-598. Zhou, K., Yu, L. Effects of extraction solvent on wheat bran antioxidant activity estimation. LWT. 2004; 37: 717-721. Min, G., Chun-Zhao, L. Comparison of techniques for the extraction of flavonoids from cultured cells of Saussurea medusa Maxim. World J Microb Biot. 2005; 21: 1461-1463.